1991 yılında kurulan Elnec, NAND flash bellekleri, mikrodenetleyiciler ve diğer programlanabilir aygıtlar için Avrupanın lider programlama çözümleri tedarikçisi konumundadır. Elnec'in ürünleri ODM adı altında B & K Precision (ABD), Dataman (İngiltere ve ABD), Minato (Japonya) ve Grifo (İtalya) altında satılmaktadır. 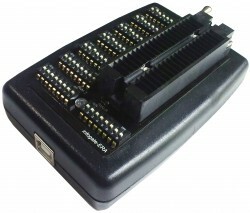 BeeProg3 is next member of Elnec universal programmer series, built to meet the strong demand for an extremely fast and reliable programmer for high-capacity memories. Designed with great emphasis on technical perfection and speed of hardware, this programmer perfectly fits for high-demanding desktop programming as well as for automated programming systems and ATE machines, where ensures the highest quality and overall yield. 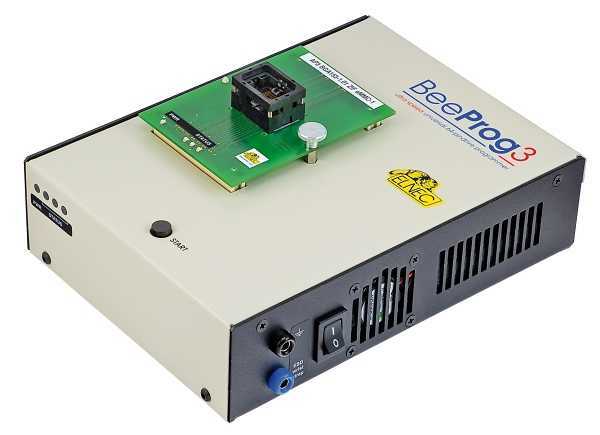 BeeProg3 programmer core is based on a state of the art FPGA, powerful ARM processor and internal SSD to be ready to program devices at theoretically possible speeds. The achieved ultra fast programming speed - more than 31 MB/s sustainable - is actually higher, than can be utilized for most of real devices. This is reflected in extremely short programming times. For example, the 8 GB eMMC NAND Flash could be done in less than 250 sec - if programmed memory allow that speed. Tests show, that the BeeProg3 is currently faster than all competitors in this price category (status: 10/2015), and for many chips is the fastest at all. BeeProg3 supports all kinds of types and silicon technologies of today's and tomorrow's programmable devices. It partially supports also devices "from yesterday". You can be sure the next devices support will require the software update only, at the most (if necessary) simple programming module, therefore the costs of ownership is minimized. You have freedom to choose the optimal device for your design. For the proper and reliable programming of ultra-fast memories the BeeProg3 utilizes specialized modules, optimally designedfor specific device families, exactly according to the needs of programmed devices. But if it is possible, then universal programming modules, dedicated for IC package type, are used. The programming modules are identical for all programmers based on the BeeProg3 programming core (BeeHive304 for example). 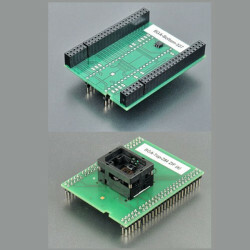 Programming modules construction is designed for perfect stability at the top of the programmer, to be tough enough for insert/replace chips by mechanical arm and also allows to keep identical position of ZIF socket also after replacing of the module. BeeProg3 interfaces with any IBM PC compatible personal computers, running MS Windows OS, through USB (2.0 HigSpeed) port or LAN port (100 Mb). With its very competitive price together with excellent hardware design for reliable programming, it is probably the best "value for money" programmer in this class. The 64-pin rich-features, precise and powerful pindriver of BeeProg3 deliver high speed, accurate and clean waveform signals to the device by eliminating noise, ground bounce and overshoot, which maximizes programming yield and guarantees long data retention. This also allows the reliable support of virtually any nonvolatile technology used for programmable devices - (E)EPROM, Flash, MRAM, PCM, ... - by a single device programmer. FPGA based totally reconfigurable TTL pindrivers provide H/L/pull_up/pull_down and read capability for each pin of the device. The dual H/L drivers enables to provide two different H levels for both core signals and I/O signals of programmed device without additional logic. Programmer pindrivers operate down to 0.8V, therefore the programmer is ready to program the full range of today's and tomorrow's advanced very-low-voltage devices. Extremely fast programming, achieved by using FPGA based state machine, fast processor and SSD, allow execution of all time-critical routines and data transfers inside of the programmer. The programmer performs device insertion test based on the check of proper signal path between the programmer and programmed device before it programs each device. 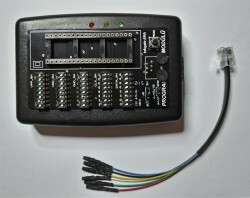 In dependence on programming configuration it identifies missed or poor contact between programmed device and the ZIF socket of the programming module, missed or poor contact between the programming module and the programmer and it's also able to indicate wrong position of device in the ZIF socket or the programming module (moved, rotated, backward oriented). These capabilities, supported by overcurrent protection and signature-byte check help prevent chip damage due to operator error. The selftest capability allows to run the diagnostic part of software to thoroughly check the health of the programmer. Built-in protection circuits eliminate damage of programmer and/or programmed device due to environment or operator failure. 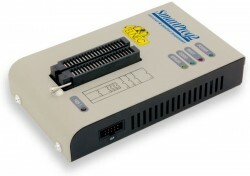 All the inputs of the BeeProg3 programmer, including the pindriver signals, connection to PC and power supply input, are protected against ESD up to 15kV. (*) Elnec PG4UW programında, ilgili entegre için belirtilen, kendi üretimi olan programlama adaptörü modeli kullanılmadığında sorumluluk kabul etmemektedir. 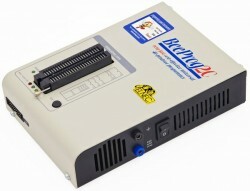 The programmer is driven by a comfortable and easy-to-use control program with pull-down menu, hot keys and on-line help. The software runs on all versions of MS Windows (from Windows XP to Windows 10 32-bit and 64-bit). Selecting of device is performed by its class, by manufacturer or simply by typing a fragment of vendor name and/or part number. Standard device-related commands (read, blank check, program, verify, erase) are boosted by some test functions (insertion test, signature-byte check), and some special functions (autoincrement, production mode - start of programming immediately after insertion of chip into socket). The rich-featured serialization function enables one to assign individual serial numbers to each programmed device - simply increments a serial number, or the function enables one to read serial numbers or any programmed device identification signatures from a file. The software also provides - in the Device information section - lots of information about the programmed device. As a special, the drawings of all available packages are provided. The software also provides explanation of chip marking (the meaning of prefixes and suffixes at the chips) for each supported chip. Jam files of JEDEC standard JESD-71 are interpreted by Jam Player. Jam files are generated by design software which is provided by the manufacturer of respective programmable device. Chips are programmed through JTAG (IEEE 1149.1 Joint Test Action Group) interface. VME files are interpreted by VME Player. VME file is a compressed binary variation of SVF file and contains high-level IEEE 1149.1 bus operations. SVF files are interpreted by SVF Player. SVF file (Serial Vector Format) contains high-level IEEE 1149.1 bus operations. SVF files are generated by design software which is provided by manufacturer of respective programmable device. Chips are programmed through JTAG interface. VME files are generated by design software which is provided by manufacturer of respective programmable device. By attaching of more BeeProg3 programmers to the same PC (through USB port) one can create a powerful multiprogramming system, which supports as many chips, as the BeeProg3 programmer supports and without obvious decreasing of programming speed. It is important to know, that there is concurrent multiprogramming - each programmer works independently and each programmer can program a different chip, if necessary. *3: the programmers up to s/n 1200-00053 (including) was supplied with 32GB SSD as internal buffer. *4: the 128GB SSD can store as a buffer roughly 110GB of the random data (28GB in case 32 GB SSD), the bigger sizes SSD, proportionally. If you plan to work/copy eMMC/NAND device, which might contain random data in full range of the device size, we recommend to have equal capacity buffer in the programmer. Algorithms: only manufacturer approved or certified algorithms are used. Custom algorithms are available for an additional fee. Algorithm updates: software updates are available regularly, approx. every 4 weeks, free of charge. OnDemand version of software is available for highly needed chips support and/or bugs fixes. Available nearly daily, depending on requests.